In Auschwitz, photographer Susan May Tell felt the presence of its ghosts guiding her, guiding her camera, and was moved to share the tragedy of this place through the images she saw through her lens. The 16 haunting black-and-white photographs in this publication, accompanied by the poetry of one of America's greatest poets, Stanley Kunitz, capture the energy that lives in that space. 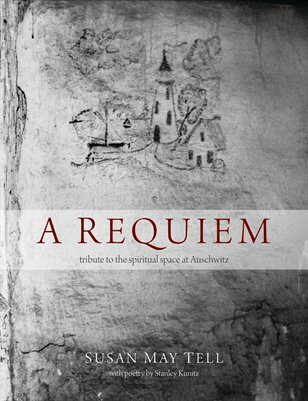 This publication was created as a catalog to accompany the traveling exhibition of "A Requiem: Tribute to the Spiritual Space at Auschwitz." The gelatin silver prints are 6 x 4 feet and, to date, have been showcased at the Griffin Museum of Photography and the Museum of Art / Fort Lauderdale. Reviews of the exhibition have appeared in ARTnews, The Forward, and Boston Globe. This important publication now serves as a physical and meditative reminder of decaying sacred grounds and the importance of memory and commemoration.